Rebus and Clarke find themselves in (well, next to) the middle of Global Politics. “Know what I think? I think all of this is because there’s a bit of the anarchist in you. You're on their side, and it annoys you that you've somehow ended up working for The Man." Rebus snorted a laugh. “Where did you get that from?" She laughed with him. “I’m right though, aren’t I? You’ve always seen yourself as being on the outside--" She broke off as their coffees arrived, dug her spoon into her cappuccino and scooped foam into her mouth. "I do my best work on the margins," Rebus said thoughtfully. Rebus is on the verge of retirement -- really, he's about to be forced out, he's at the stage of his career where many detectives would be just coming into the office and doing nothing -- if not outright retiring already. And, truth be told, that's precisely what everyone in the force seems to want (except for a few allies/friends), particularly the top brass. None of which Rebus has an interest in. He's going to have to be pulled out, kicking and screaming -- probably with someone barring the door after he's out. So when the G8 comes to Edinburgh in 2005, the police have their hands full with security, protests, riot preparations, and whatnot. They're importing help from all over Scotland and even England. Everyone has plenty of assignments to deal with, everyone but John Rebus, that is. So when a clue comes up that might turn into something interesting on months-old murder case, he's ready and raring to go. That evidence seems to point at multiple victims, too -- so Siobhan Clarke is put in charge of that investigation, just please keep it quiet until all the important people have gone home (and yes, everyone is fully aware of the insult of putting the DS in charge of the DI on this one). Thankfully, there's a suspicious-looking suicide that's related to the G8 for Rebus to focus on. At least one of the victims in Clarke's case has an obvious connection to Big Ger Cafferty, too. Because why not make this all interesting? Big Ger's the target of a local politician who happens to be making a lot of waves thanks to being in all the right places during the G8 protests, sticking up for his constituents and the cause of civility in the face of civil unrest. Rebus and Cafferty do their usual thing -- Cafferty wants information so he can get his form of justice taken out of the murderer, Rebus needs information from Cafferty so he can prevent that. But at the end of the day here, Siobhan spends more time with Cafferty, despite everything Rebus tries to do. Which is the crux of this novel, really. Rebus is at his career's end, he knows it. The closest thing he has to a legacy is DS Clarke -- and he wants it to be a good legacy. He wants to keep her from Cafferty's clutches, from the dirt that's dogged him for years due to guilt-by-association -- as well as his actual influence. At the same time, he wants her to maintain that "work on the margins" attitude, while staying in good graces with TPTB. He wants Clarke to be everything he is, just without all the bad that comes from it. (I think she wants that, too, actually). Bringing me back to the point that this novel features Rebus fighting all involved for Siobhan's soul. In an interesting parallel, Siobhan's actual parents are in town to take part in the G8 protests. There's a young woman hanging out with them, almost like a temporary daughter (which really gets under her skin). She's determined to spend some time with them, to show herself that she can have some sort of personal life -- a family -- and still be a good cop. To not be Rebus. At the same time, she so wants her parents to see her as a capable detective, not just someone in the midst of a defiant reaction to her parent's lifestyle and beliefs. Eric Bains shows up in a light I don't think anyone expected, and I'm hoping that things turn around for him soon. I like the guy. He's not Brian Holmes, but he's a nice character to have around. There's a reporter, Marie Henderson, involved in all of this, too (that's her opining in the opening quotation) -- I really liked her, and hope we see her again. Rebus seems to actually enjoy her company and intelligence -- at the same time, as the co-writer of Cafferty's biography, she represents everything that Rebus fears for Clarke. I've not spent a lot of time talking about the cases -- which are interesting enough, and watching Rebus not be careful around Very Important People from all over the world is fun. But on the whole, the cases felt familiar. Like we've been down these roads before -- not exactly, and both held plenty of surprises, but they seemed like familiar Rebus/Clarke investigations. I might have been tempted to give his a 3-Star rating and move on. 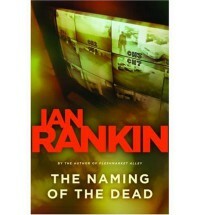 BUT, Rankin won't let me -- because putting all of this right smack in the middle of the G8 conference -- and the hullabaloo surrounding it (protests, concerts, marches) -- the Bush bicycling incident, the London bombings, and the announcement of the Olympics coming to London -- added so much to the novel. It grounded it in reality, it presented so many obstacles to the investigations (as well as distractions from the investigations) -- as well as unexpected sources of help (police officers from other jurisdictions that had just the right kind of information). Plus all the "keep Siobhan from becoming Rebus" elements of the novel just captivated me.